My portfolio performed quite well in the month of March. The monthly gain of $13,120, or 1.9% of the portfolio size, is almost a full percentage point above the S&P 500 gains. The gain is helped by my sizable foreign equity exposure, and an opportunistic gain in a particular stock position. 1) Apparently my problem, again, is too much cash. While my $200,000 cash position is generating a risk-free $10,000 return a year, I will need to be more aggressive if I want to do better. 2) I will start dollar-cost averaging to gradually increase my foreign equity exposure from the current 30% to 35% in the next six months. It will mean a monthly purchase of $10,000. 3) I'm also in the lookout for more stock ideas. i'd think about if you're upping your position on AIG, you may want to up your position in COP or create a position in XOM. the reason being is that i think that might hedge against an active hurricane season - if there is a big insurance outlay because of damages, price of the refined oil will also likely have been effected. also, XOM and COP, to me, are solid investments that will appreciate over time anyways so, no downside, per se. MM - I think the S&P500 is a bad benchmark, due to your portfolio allocation. A rough calculation shows that you have just under 50% of your total equity portfolio in overseas-oriented funds. Shouldn't you use a 'blended rate' of say the S&P500 and a foreign index, such as the MSCI EAFE? The S&P500 was up 1% in March, and the MSCI EAFE was up over 4%. A rough benchmark of 60% S&P500 and 40% MSCI EAFE would yield a benchmark return of 2.24%, which beats your portfolio's return of 1.9% by almost 20%. To me, it's important to have an apples-to-apples comparison when analyzing performance. Think about how much easier your life would be, and the better returns you'd earn, if you dropped your amazing nest egg into just three Vanguard Funds: 10% in the Prime Money Market Fund, 55% in the Total Stock Market Index Fund, and 35% in the Total International Stock Index Fund. Your performance last month would've been right at 2%, or 5% better than your portfolio, with no hassel. 5% over an investing lifetime can add up to millions of dollars. I agree totally with CPA1298. In fact, try as a different benchmark the IFA 100 portfolio. That's not to detract from you having had a good month, but was your month's returns worth higher risk and your personal effort. The latter it may be, the former I highly doubt. Jamie - thanks for the support and for leading me to the IFA website. Do you think MM could benefit from the 12-step proram? 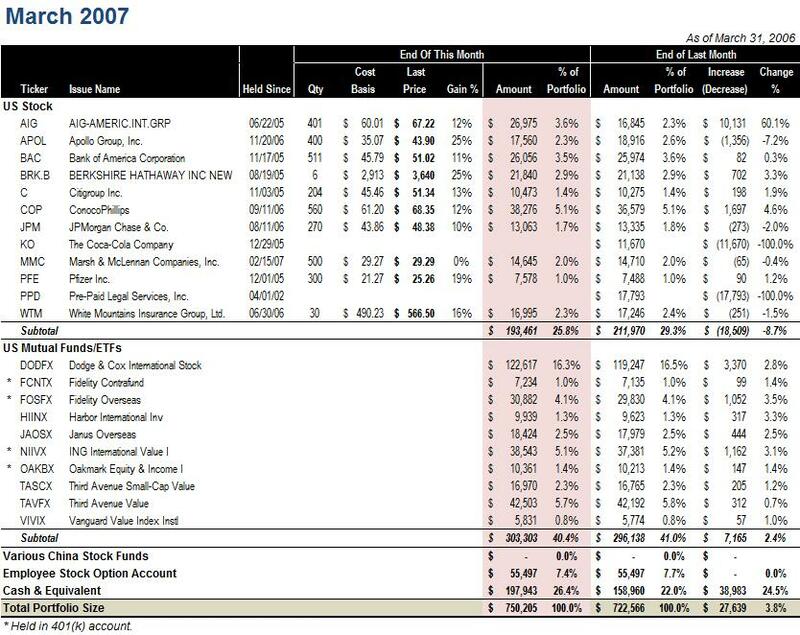 To me it's important to note that MM's portfolio, with it's risk and effort, did not match the benchmark index; it returned less than the index. As he might say, his portfolio has negative 'alpha'. I'm convinced that no investor can consistently beat the market, especially amateur investors who lack the time, training, and (inside) information to which the professionals have access. "... I will need to be more aggressive if I want to do better...". How do you track your investment? I use microsoft money but not very happy. It has trouble doing asset allocation and report investment gains. Have not found a good portfolio tracking software. Have you considered some more leveraged products? Over in the UK we have some types of derivatives known as CFDs (Contract For Difference) and of course, Spread Betting. I myself haven't investigated either of these two yet but it would seem that if your views about a particular stock are strongly held then it could be time to venture into the derivatives world? Insurance companies are good with Hurricane season. The big hits are rare, but what happens if the insurance company does get hit is that they up the premiums and pass the price onto customers. AIG's dividend is growing and its pe is under 11. This portfolio is too slow money for me, but its working for you. KO had a nice day today also. I think the admin of this website is truly working hard in support of his web page, as here every data is quality based material. Simply wish to say your article is as amazing. The clearness for your publish is just cool and that i can assume you're an expert in this subject. Fine with your permission let me to seize your RSS feed to stay up to date with forthcoming post. Thanks one million and please keep up the gratifying work. Simply want to say your article is as surprising. The clearness to your submit is simply cool and i can assume you're an expert on this subject. Well together with your permission let me to grab your RSS feed to stay up to date with drawing close post. Thank you a million and please continue the enjoyable work. With havin so much content do you ever run into any issues of plagorism or copyright infringement? My website has a lot of exclusive content I've either authored myself or outsourced but it seems a lot of it is popping it up all over the web without my agreement. Do you know any solutions to help prevent content from being stolen? I'd genuinely appreciate it.